Jordan has a young, largely urban population of 9.5 million. Despite its status as an upper middle-income country, it has pockets of food insecurity, especially where refugee-hosting communities remain seriously affected by the protracted economic crisis of 2008 and the continuing conflict in Syria. Right now Jordan is home to nearly 700,000 registered Syrian refugees. Jordan is one of the world’s four most water-deficit countries. It is ranked 102 out of 155 countries on the 2014 Gender Inequality Index and 80 out of 188 countries in the Human Development Index. WFP has been present in Jordan since 1964. The U.N. agency’s assistance in Jordan focuses on providing food assistance to Syrian refugees and supporting the government on improving the quality of life for Jordanians, creating income-generating opportunities and guaranteeing social welfare. WFP’s support comes at a time when the country is faced with a chronic economic crisis, further exacerbated by the Syrian refugee crisis. Since 2012, a Regional Emergency Operation has provided food assistance through e-cards to Syrian refugees in communities and camps, in addition to school meals and daily distributions of fresh bread in the camps. 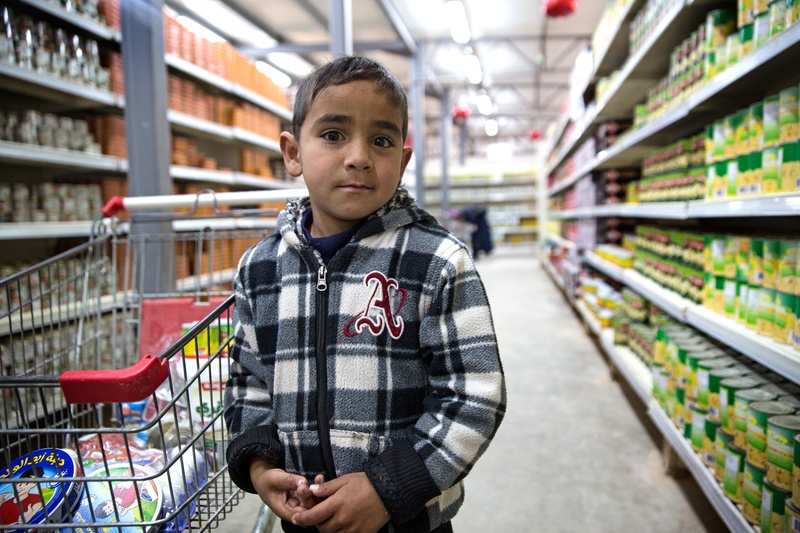 Outside the camps, WFP has implemented a targeted approach with extremely vulnerable and vulnerable Syrian families. To address food insecurity, WFP initiated a Protracted Relief and Recovery Operation in 2014 that aims to improve food security for affected Jordanians as well. This includes targeted food rations for the most vulnerable; food-for-assets initiatives that provide e-cards in exchange for work on forest and rangeland rehabilitation and food-for-training initiatives that offer vocational training opportunities and on-the-job training to develop human capital and improve employability. E-cards supports the local economy by partnering with approved retailers. In 2014, WFP resumed its school meals program in Jordan, which aims to reach more than 320,000 schoolchildren throughout 2016, focusing on the most food-insecure areas. WFP distributes locally produced date bars three days per week, while the Government provides high-energy biscuits and fresh fruit during the remaining two days of the school week. Each meal meets the children’s daily micronutrient needs.